I really don’t understand this one myself. See if it makes sense to you. This entry was posted on August 31, 2008 at 6:53 pm and is filed under Thoughts & Musings. You can subscribe via RSS 2.0 feed to this post's comments. You can comment below, or link to this permanent URL from your own site. Yes, let me interpret this for you. 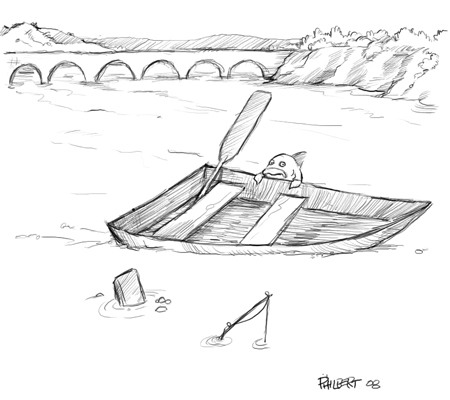 The boat represents the RS, a publication that henceforth will only be refered to using initials.You have been thrown overboard and are now fishing for other prospects although you feel overwhelmed and submerged by doubts.The fish represents an adoring fan who looks on with consternation at this turn of events.The bridge in the distance represents the future yet where it leads we know not. The water is not that deep.There is hope. Holy Guacamole! That was freakin’ good! I wish I was that smart. You were an English Lit major weren’t you, Tom? No,but I did have a brief musical gig at Hester elementary school in San Jose.I was a member of the Bluebird Drum and Bugle corps.I was the lead drummer but unfortunately during one of our performances one of my drum sticks slipped from my hand and impaled an elderly gentleman in the front row.I was summarily drummed from the corps.